May Jazz Guide is out there! online events - view now! VIKA YERMOLYEVA - FILL YOUR VENUE! Subscribe to JG Online and ensure your events are always displayed here in date order. 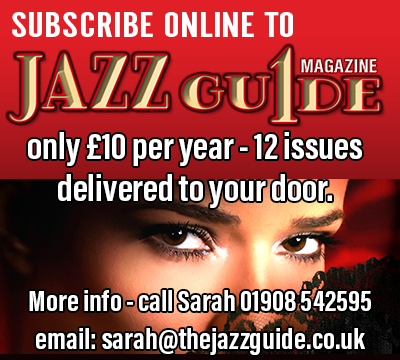 Subscriber feedback tells us this works for them..
Jazz Fans and Advertisers who subscribe for the website facility will have the opportunity to express their own views on this new site. You will be able to post your own news items (via your own password) - obviously, all entries will be pre-vetted by us to ensure acceptable manners. Our relentless policy of remaining polite and non-political must be observed. There will also be an exclusive section for all subscribers, with news articles and hot announcements. Subscribed venues and promoters will also have their own password protected page - a great opportunity in using a dedicated outlet to sell tickets and publicise all their events - remember - IF THEY DON'T KNOW - THEY WON'T GO! Latest news, offers, band changes, additional guests - the list goes on. As well as publicising and promoting Jazz & Live Music events, we make every effort to show new and refreshing material from around the scene in an attempt to widen interest. Currently, the new website is attracting in excess of 12,000 pageviews per month. We are also working on a plan to extend our social media facility. Subscribe for the latest Band, Artist And Venue Updates. Sam has kindly agreed to share some of his band photos with us. I think they are stunning/dramatic/moody. Look out for his own page in the media section - better still, visit his site and admire his talents for yourself. Here - we'll try to bring you news & updates on all things 'live and alive'. Coming in 2019 - The JG Blog spot! The May issue shows a gig at St. The Dragon Jazzmen's Residency - every 2nd Monday of the month @ The Navigation Inn has changed starting time. Antonio Carlos Jobim was the foremost composer of authentic Brazilian bossa nova and samba-derived, popular jazz music.